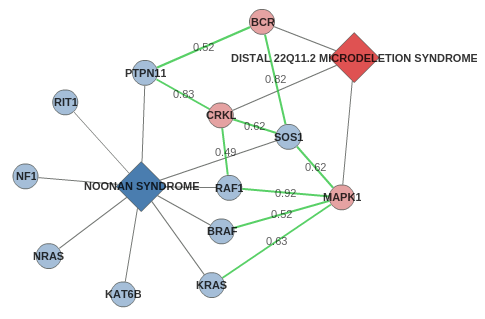 ODCs (Orphan Disease Connections) is a web-based application to explore potential relationships between rare diseases established through the integration of disease susceptibility genes and protein-protein interactions. The current version contains 54,941 relationships between 3,032 diseases and 3,061 genes. See all the rare diseases and genes included in ODCs here. Interested in one disease and its potential connections? Click on Rare disease search. Interested in exploring the connections of two diseases? Click on Diseases connection search. Interested in one gene or protein? Click on Gene search. Rare disease information and susceptibility genes from Orphadata. Data version 1.0.20. "Orphadata: Free access data from Orphanet. © INSERM 1997. Available on http://www.orphadata.org". Protein interactions from HIPPIE (Human integrated protein-protein interaction reference). Release 09/05/14. "Schaefer et al (2012) PLoS ONE 7(2): e31826". As well as facilitating searches to the PubMed. Introduce a valid rare disease name or synonym and click the "Search" button to display information on that disease as well as its potential relationships with other rare diseases. For example, this is the output provided for Rett syndrome. A summary panel on the right displays OMIM references, the number of associated genes and signs/symptoms (from Orphadata), as well as the number of connected diseases calculated by OCDs. The details are shown on the tabs below the panel. The central red node is the disease of interest (in this case, Rett syndrome). Yellow nodes represent diseases that share at least one susceptibility gene with the central disease (bigger nodes mean more susceptibility genes shared). Blue nodes represent diseases that are connected through protein-protein interactions. A panel in the bottom left corner allows the user to zoom the network diagram. Click on a yellow or blue node. This will show two additional buttons at the bottom of the graph: the first one links out to the corresponding disease page in Orphanet; the second, displays the details of the connection between the disease selected and Rett syndrome in ODCs (as if you perform a Diseases connection search). You can export the network data clicking on the button at the top of the graph (CSV file). Introduce two valid rare disease names or synonyms and click the "Search" button to explore their potential relationship. ODCs establishes relationships through disease susceptibility genes and corresponding protein-protein interactions. As an example you can search Noonan syndrome and Costello syndrome. Gene/protein nodes are represented as circles, colored by the same color as their corresponding disease. 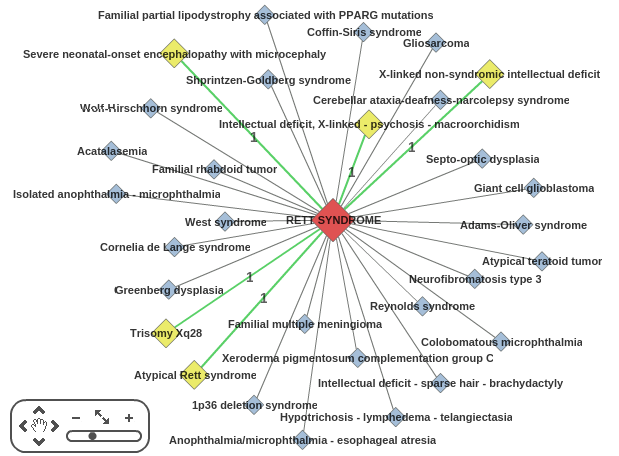 Yellow circles show genes shared by the two diseases. 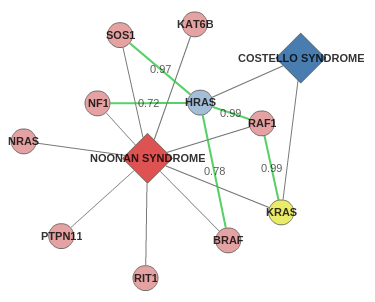 In this example both Noonan and Costello syndromes share one gene, KRAS, and their relationship can also be explained by the interactions between HRAS and RAF1, SOS1, BRAF and NF1. The scores of each protein-protein interaction in HIPPIE are also displayed in the graph. You can also select one gene/protein node to access information in UniProt (click the UniProt button) or to explore other disease associations, as if you perform a Gene search (click the ODCs button). Click on the "Export data" button to download the information shown in the graph. Explore the tabs to see the diseases genes (links out to UniProt and OMIM) and interactome associations (links out to evidences on HIPPIE). Now you can easily search the biomedical literature (click on PubMed search), select disease names and/or genes (e.g. Noonan syndrome and MAPK1), and finally click on the "Search on PubMed.gov" button. In this search, ODCs shows the rare diseases associated with a gene. Introduce a valid gene name, for example SOX10, and click the "Search" button. 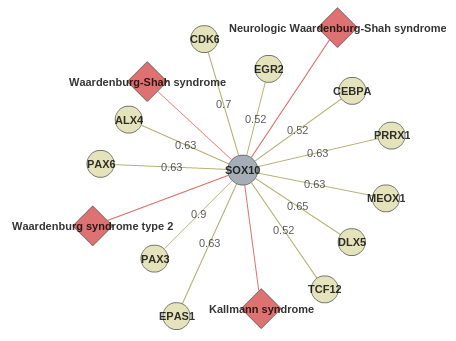 A summary panel on the right shows that SOX10 is associated with 4 rare disases and has been described to interact with 11 proteins. External references (UniProt and OMIM) are also available. More details on the tabs below the panel. Genes/proteins are represented as circles, centered around SOX10 in grey. HIPPIE scores are shown for each protein-protein interaction. Associated diseases are shown as red diamonds. You can click on any gene/protein to access further information in UniProt or to display a new ODCs search centered on that gene. Click on any rare disease to access further information in Orphanet or to display a new ODCs search centered on that disease. An "Export data" button is also available. ODCs is optimized for PCs and mobile devices. For a correct visualization of the networks a modern browser with the Flash plugin installed is needed. http://csbg.cnb.csic.es/odcs/connection_showresults.php?orphanum1=648∨phanum2=3071 (Noonan and Costello syndromes).